7:00 pm Buffet dinner: Cost $30 per person, $28 for Friends of Maricopa Audubon”. Deadline to register is Friday, May 3, 2019. Our agenda will include induction of our new Board and a presentation of the Ninth Annual Herb Fibel Memorial Award for Distinguished Service to the Maricopa Audubon Society. While birding at Oregon's Finley National Wildlife Refuge in his teens, Rich Hoyer heard the most amazing thing - a Purple Finch incorporating sounds of a California Scrub-Jay in its jumbled song - and thought he had discovered something new, since such behavior wasn't mentioned in any field guide. Since then he's been fascinated and intrigued by mimicry in birds, collecting personal observations and recordings of the phenomenon. In this audiovisual presentation, Rich Hoyer will present examples of mimicry in songbirds from throughout the Americas and share his enthusiasm for this curious and often entertaining behavior. Born and raised in Oregon, Rich Hoyer earned his bachelors degrees in German and Zoology at Oregon State University. 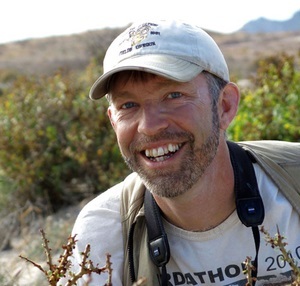 Following a few years as an itinerant biologist and summer guide on Saint Paul Island, Alaska, he moved to Tucson, Arizona and has been working as a professional birding tour leader for WINGS for the past 19 years. He leads tours to such exciting locations as Brazil, Bolivia, Peru, Costa Rica, Mexico, Belize, and Jamaica, but he also looks forward to his annual tours that explore the beauty and diversity of his home state. This program will take you on a tour around Arizona to some of the state’s most productive and interesting birding spots including a number of lesser known areas as highlighted in Charles Babbitt’s new book Birding Arizona-What to know, Where to go. Along the way we will explore a variety of different habitats and learn about multiple facets of Arizona bird migration including the summer influx of birds from the Gulf of California, fall hawk and shorebird migrations, and great places to watch spring and fall passerine migration. Charles will remain after the meeting to sign copies of his book. Books are available for $18.00 for MAS members and $19.95 for non-members. Charles Babbitt is a past president of the Maricopa Audubon Society and a past member of the Arizona Bird Committee. He enjoys leading field trips for the Maricopa Audubon Society and bird walks at Boyce Thompson Arboretum. Pre-meeting dinner will be held at 6:00 pm at the Noodles Ranch restaurant, 2765 N Scottsdale Rd, Scottsdale, AZ 85257 . Social Hour from 7:00 - 7:30 pm prior to program meeting at the Papago Buttes Church of the Brethren, 2450 N 64th Street, Scottsdale, AZ. . Nature videographer, Larry Arbanas, will present some of his fascinating footage of nesting Killdeer and other random video he has recently edited. Larry has filmed for the Cornell Lab of Ornithology, US Fish and Wildlife Service, US Forest Service, Bureau of Land Management, PBS, The Canada Museum of Nature, National Geographic and Maya Lin, creator of the Vietnam Wall War Memorial in Washington, DC.